This pond is part of a private golf course in Spokane and on the North side of this lake and there is a housing development on the South side with a depth of 10'. This pond is off limits to all watercraft except RC model sailboats (motorized rc model boats not allowed). You have to seek permission to sail this pond via the office at the golf course. When it gets hot this lake does tend to have some algae build up on it, but there is a water circulating system on the lake that helps to reduce this build up. There is no visible water outlet and inlet to this lake such as a stream. Directions/Maps: To view a map click on google.com/maps and type Wandermere Golf Course. Address is in 13700 N Wandermere Rd, Spokane, WA. 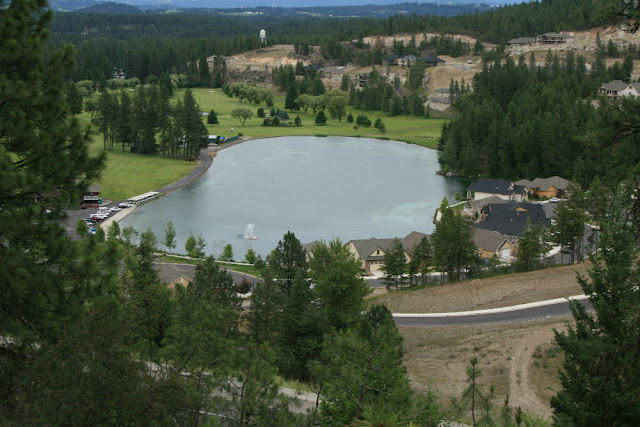 INFO: Wandermere Golf Course; 509-466-8023, 13700 N Wandermere Rd, Spokane, WA 99208. ACCESSIBILITY: PARKING... Large paved parking lot; PATHS/TRAILS... Accessible sidewalk on the north shore right next to the water; RESTROOMS/FACILITIES… Fully accessible restrooms at Golf Course office/club building; SENSORY... No sensory tactile markers for those with visual and other impairments. DOCKS/LAUNCHES/PLATFORMS… None. Accessing the water is not allowed other than maybe with non-motorized radio controlled boats, such as sailboats; DIRECT WATER ACCESS… Water access not allowed; TRANSFER SYSTEMS... Not needed due to no water access; CAMPING... No; O.T.H.E.R… Oddities/Barriers: Nothing unusual; Terrain: Level to about 2% grade; H2O/Water: Water normally murky; Environmental Conditions: Nothing unusual; Resources: Food, drinks, and gas in city of Spokane.